Choice Line $276,361 3,724 TOTAL SQ. FT. | $74/SQ. FT. Select Line $314,047 3,868 TOTAL SQ. FT. | $81/SQ. FT.
First Floor 1265 Sq. Ft.
Second Floor 1703 Sq. Ft.
Total Heated 2967 Sq. Ft.
Front Covered Porch 273 Sq. Ft. Optional Rear Deck 144 Sq. Ft. Optional Terrace Level 1304 Sq. Ft. Looking for versatility, our MountainRidge offers a range of options with two flex spaces on the main floor. 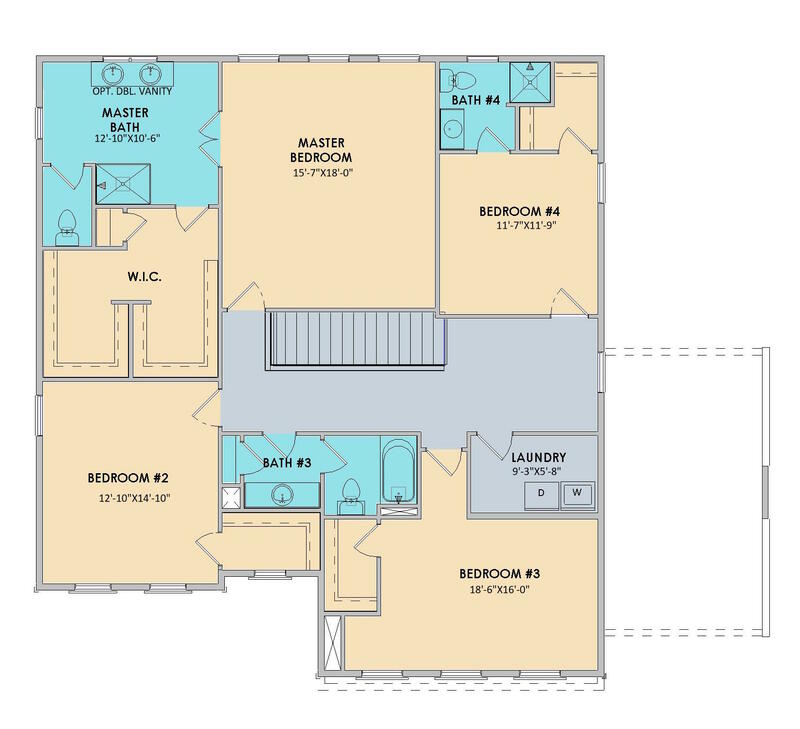 This plan also has a huge master suite with an extra-large his and hers walk-in closet! All the bedroom are on the second level along with the laundry room for convenience! There is also an option of a third car garage make for a great workshop or storage location. 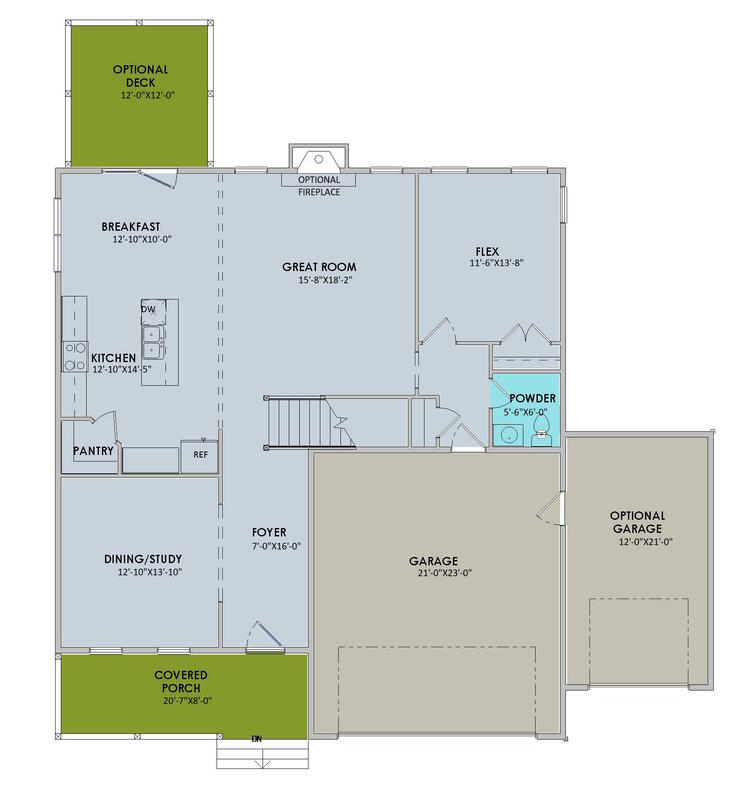 Take a look at the floor plan above & just imagine the possibilities this plan has to offer your family! All Brown Haven Home plans include luxury finishes and superior products. The MountainRidge single-family home plan is 3,724 square feet, has 4 bedrooms, 3.5 bathrooms, and 2 garage spaces. Starting from $276,361, the MountainRidge home can be built “On Your Lot” in Hiawassee, Georgia. Other nearby locations you can build a new MountainRidge home include Clay County, Hiawassee in Towns County, and Union County, Georgia. In all, we build our award-winning custom homes in twenty-one Georgia counties. Similar custom homes in Hiawassee you may love include the 3,634 square foot MistyRidge plan, the Creekside, a 3-bath home, and the 4 bedroom MeadowView custom home.